Yet another upgrade to my aging laptop. From 2GB my laptop now has 4GB of memory and what better way to exploit the use of this upgrade than to upgrade my operating system as well. Enter Windows 7 Ultimate 64 bit. Good thing though my upgrade to 64 bit was less dramatic than my installation with the 32 bit version. I couldn’t say that it was an upgrade as the term implies because I had to reinstall everything after backing up all my data pre 64 bit and doing a clean install. 1. Made a backup and imaged the whole laptop drive. 2. Reboot, formatted the install drive (C: in my case) and let the installer do its thing. 4. The three Base System Device requires the ricoh card reader driver, the two Unknown Device is the atk100 and infrared module respectively. The Fingerprint Sensor requires the authentec fingerprint driver. Please note this is for my ASUS F8 series which is an F8SG-4P03A. 5. Then I proceeded to install the following. 6. The Nvidia video driver for 9300M G. Rebooted after install. 7. ATK100 driver for Windows 7 64 bit. This is for the extra buttons and indicators (wifi, bluetooth) to work properly. Rebooted after install. 8. Installed the ATK hotkey software rebooted, then installed the ATK Media software. 9. Installed the RICOH Card Reader driver then rebooted. 10. 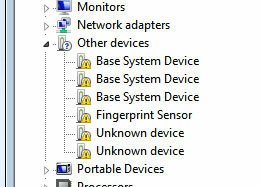 Installed the fingerprint software/driver then finally the infrared module driver. Thanks for this site. I recently did similar upgrade from 2GB mem to 4GB. Vista 32-bit is killing me, so upgrading it to Windows 7 64-bit Home Premium. My model is F8SG-4P016C. What’s the difference from your 4P03A edition? I assume the drivers should still be applicable to mine. Not really sure about the hardware specs, it should be similar. Where did you buy your laptop from? Hi, Can you help me please…? How can i find Drivers for Windows 7 64 bit? Please specify details with your installation problems, that would allow me to help you better. We can start from the errors that you are getting. I have an with 3MB RAM, and have decided to clean install Win 7 Home Premium 64-bit. I use Canon’s IP100 and MX860 printers and their scanner 8800F. As far as I can see, Canon’s site should provide the drivers. Apart fom these, I think I can cherry pick from your post. Any pitfalls? Unfortunately, I don’t have extensive experience with printers as I barely use them. I suggest you use the cd/dvd that came with your hardware if it was purchased this year it should have support for Windows 7 both the 32 and 64 bit version. Please follow the exact install sequence provided by the manufacturer specially for usb printers, as I notice some quirky bugs arise when installed another way. I can probably look for 64bit drivers for your laptop but frankly, just don’t have the time right now. I’d always suggest going for 64bit but just for the sake of driver availability your best bet would be to install Windows 7 32bit for your laptop. Then all the drivers you need can be found here: http://bit.ly/J3pOQW. Hope this helps.